Like currency, your business data is life-blood; and there are many ways that business data can be lost. Chances are, one or more of these have happened to you, or you know someone who has experienced one of these. 1 offsite (NOTE: Dropbox, Google Drive or OneDrive are not strictly backup because if you delete a file on your device, it will also delete in the offsite folder). Here is an example of an effective 321 backup process. Your business has an onsite server with 5 onsite PC's on the network and 3 offsite laptops also connected to the server via the internet. All files reside on the server. There is a hard drive backup on site hooked to the server that copies all the files. There is also a backup "in the cloud", where the files are updated and stored offsite. In this example, there are 3 copies of the files, 2 of which are on independent onsite devices and 1 copy is offsite. There can be variations on this theme depending on the configurations of desktops, laptops and users but the ratio of 321 shouldn't change. The challenge is to configure your 321 process so that backups occur at an appropriate frequency through a mix of automation and procedures. The chances are that if you experience any form of data breach, then not only is your company's information at risk but you are also at risk of breaching the privacy act. It's often assumed that data breach only means being hacked by a sophisticated gang from a rogue nation trying to influence votes or steal national secrets; It is more often associated with the wrongful acquisition of personal information that is residing in the databases of small to medium-sized businesses. Is a Tax File Number recipient. You might be surprised at what constitutes an eligible data breach and how a breach could occur. An eligible Breach refers to the unauthorised access, loss, or disclosure of personal information that could cause serious harm to the individual whose personal information was involved in the data breach. "Serious harm" in this context, may include physical, psychological, emotional, financial or reputational harm. This affects any business who holds personal information about their clients such as medical records or credit card details. Lost or stolen laptops or other mobile electronic devices. Physical access by an individual to unsecured document recycling. Unauthorised access to personal records by an employee. Data security is an on-going issue for all businesses and this change to the privacy act has added another dimension to the responsibility of most businesses. To notify of a data breach, visit the Office of the Australian Information Commissioner's (OAIC) website and fill in the "Notifiable Data Breach Form". If a business fails to disclose a data breach on more than two occasions, the OAIC can seek a penalty of up to $21M. Digital information loss is by far the hardest to protect against as hacking attempts can take place from anywhere at any time. Simply clicking on the wrong email or visiting a compromised website can lead to your customer's data being leaked. LOYAL I.T.- We specialise in I.T. solutions for your business; providing software, hardware, networks, configurations, consulting and support for 15 years from our base on the Central Coast. Loyal I.T. Solutions will be closed from midday December 22nd through to 8:30am on Monday January 8th. We will have select members of our team available for emergencies between these two dates. Should you require emergency assistance during that time, please contact our office on 02 4337 0700 for instructions. We thank all of our clients for your continued support during 2017. Wishing you and your families a very Merry Christmas and all the best for 2018. Email and passwords leaked - how to check yours. It's happened again. Yahoo reports there has been a huge data leak of the email addresses and passwords of 771 million people. I did not escape the breach, nor did many of the email addresses we use at Loyal I.T. Currently, it is unknown where the breach occurred, but it is important for everyone who has been breached, to update your password to something new and most importantly, something strong. Strong passwords are generally over 8 characters long, contain a capital letter, a number and a symbol. To check to see if your email address and password have been compromised, visit https://haveibeenpwned.com/ and enter your email address. If you have been pwned (the internet's cute way of saying "owned") then it is suggested to change the password for that email account and for any accounts you use that email address to log in to. If you need assistance with updating your passwords, please contact us on 02 4337 0700. Michael T & Naomi piled into Brendan's car on a Tuesday morning recently, ready to take on the "big smoke" Darling Harbour, Sydney to attend the annual I.T. trade show CeBIT. For Michael & Brendan, this was not their first time however, for Naomi it was. Naomi was busy questioning the guys on the drive down about all things I.T. in the hope to get her "geek on". We arrive & it is on! There were multiple speakers, stands galore & geeks (I mean, I.T. like people) everywhere! Our first stop was the speaker who discussed "IoT" meaning "Internet of Things". This was actually really interesting speech, in short, the Internet of Things refers to the growing network of connected objects that are able to collect and exchange data using embedded sensors. Cars, lights, refrigerators, watches and other appliances can all be connected to the IoT. - Smart homes ie Lights that can be dimmed, T.V systems that can be programmed, air conditioners that can be switched on etc all from your mobile phone. The speaker also touched on how the cost of I.T. infrastructure has reduced dramatically over the years, one key point he made was back in the day, it would cost approx. $10k for 1 TB of data storage in the Cloud, now it costs around $100.00 for 1 TB of data storage in the Cloud. After this talk, and being wowed with an I.T. overload, we needed to top up our energy reserves with an impromptu yummy lunch on the Harbour edge, where we spared a thought for our colleagues who were holding the fort in our absence..
Recharged and ready to go, we were straight back into the trade show, where we were dazzled by the robotic dog. 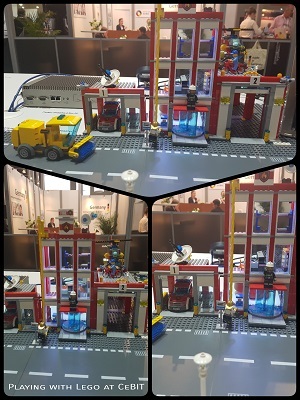 Got to play with Lego. 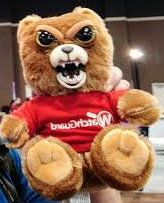 We tried to win a cute, fluffy evil Watchguard Ransombear but, we completely bombed out. Got to sit in a driverless Pod car that is going to become the way we travel in cities in the near future. 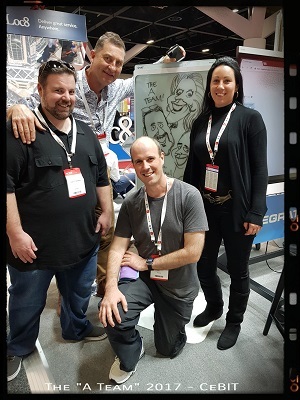 and we had an amazing (lifelike) drawing of the "A Team" done on the Smart Kapp board by newspaper cartoonist, Peter Byrne. This whiteboard could live stream the image to a nearby TV screen and when done, the image emailed in PDF format to selected email addresses. Amazing technology. All in all, we had a great day learning all about the IoT, or as Microsoft like to say "IoYT - Internet of Your Things".